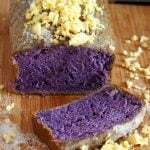 A website focusing on providing quality recipes for baking pastries, bread and desserts. Croissant dough can be very intimidating but all you need is time, a little bit of muscle strength, patience and you are guaranteed to make this beautiful pastry at home. This croissant dough is an easier method yet yields a flaky and buttery pastry. Finally, I have gathered the courage to tackle this croissant dough project that I have been putting aside for a looong time now. I love croissants. I love anything that is buttery and flaky, period. So last week, after seeing the beautiful pastries behind the McCafe bakery shelf at McDonald’s, I have finally decided that I can’t live another day and not make croissants at home. And why not? I love baking, I love croissants, so it does not just make any sense why I must put off the idea of making them. 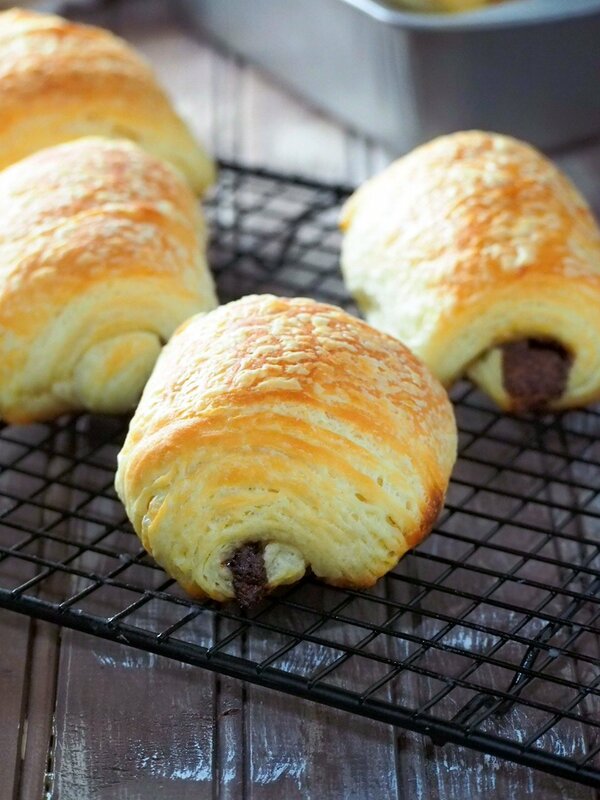 The chocolate croissants in the photo above are made of the croissant dough recipe that I am sharing today. They are amazing, so flaky and buttery! I have come face to face with lots of croissants recipe. After countless times of studying recipes one after another, staring at them and then blinking my eyes at the long, laborious process. I have finally settled on one recipe to start. I have seen croissant recipes that use a starter. I have seen some using fresh yeast. I have seen some using a combination of flours. 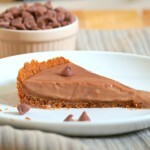 This recipe wins over them because it is simpler and straightforward. It is a perfect fit for me. When I learned that this recipe is from Nancy Silverton, another one of my baking heroes, the one who has written my favorite brioche recipe, I just jumped right in and decided to give it a go. To start, make the dough. Warm the milk to 105- 110 F. This temperature of liquid is the most ideal for the yeast to proof. Combine warm milk, sugar and yeast in the bowl of your stand mixer. Let this stand until thick and foamy, about 5 minutes. Some bakers skip the waiting time and go ahead with the next process. I would say that is fine, but for a long process like making croissants, it is always a good practice to ensure that your yeast is alive and working. If the mixture does not foam at all even after waiting longer, discard mixture and start again. Add 3 and 3/4 cups of unbleached all purpose flour and salt to the yeast mixture. 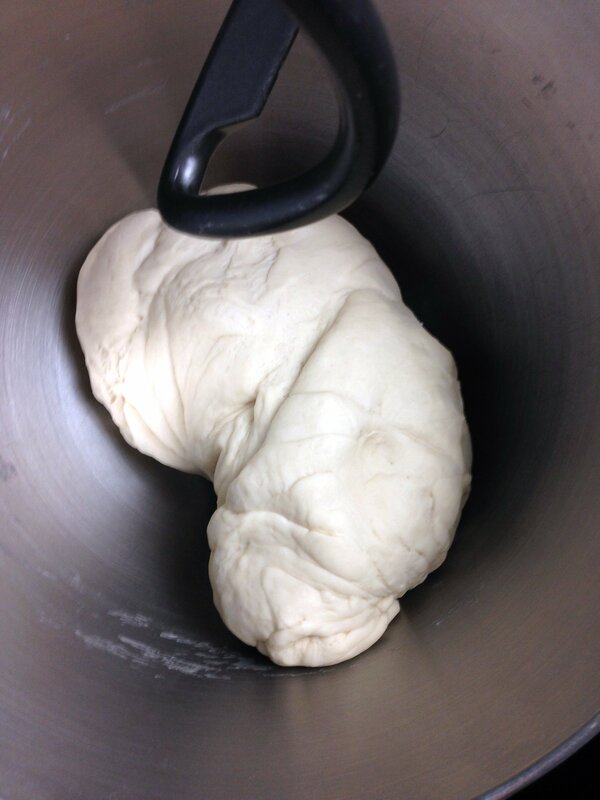 Attach the dough hook and mix on low speed for about 7 minutes, until the dough is smooth and soft. Transfer dough to a clean, floured surface and knead briefly for about two minutes, adding flour a little at a time as necessary. You will only need about 1-3 tablespoons of the flour. Pat and shape the dough to a 1 and 1/2 inch thick rectangle. Wrap it in plastic and chill in the fridge for 1 hour. While the dough is in the fridge, prepare the butter. Align butter sticks on top of a clean, lint- free kitchen towel side by side so that they form a block (do not use terry towels). 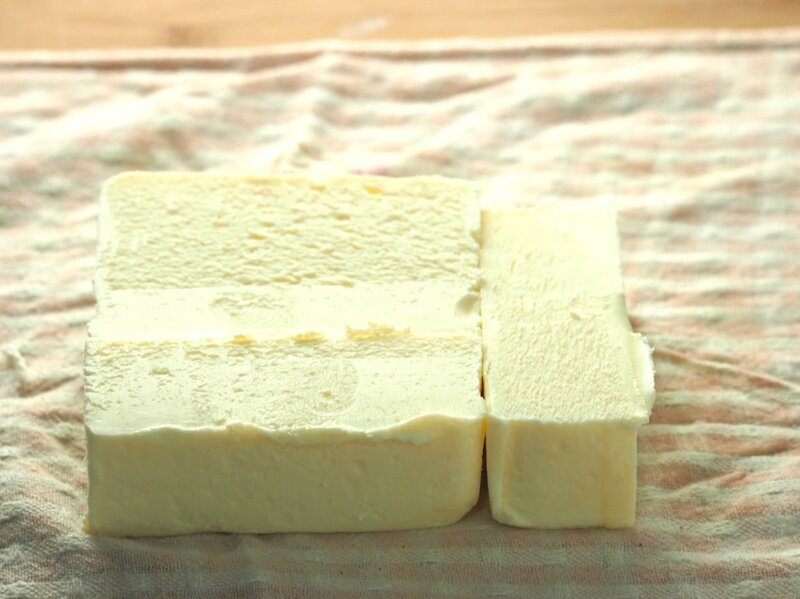 If your butter is not pre-cut into sticks, just cut them so that they are almost the same thickness and arrange them in a neat block as shown here. Now using a rolling pin, pound the butter so that it becomes malleable. We want it soft, but cold. 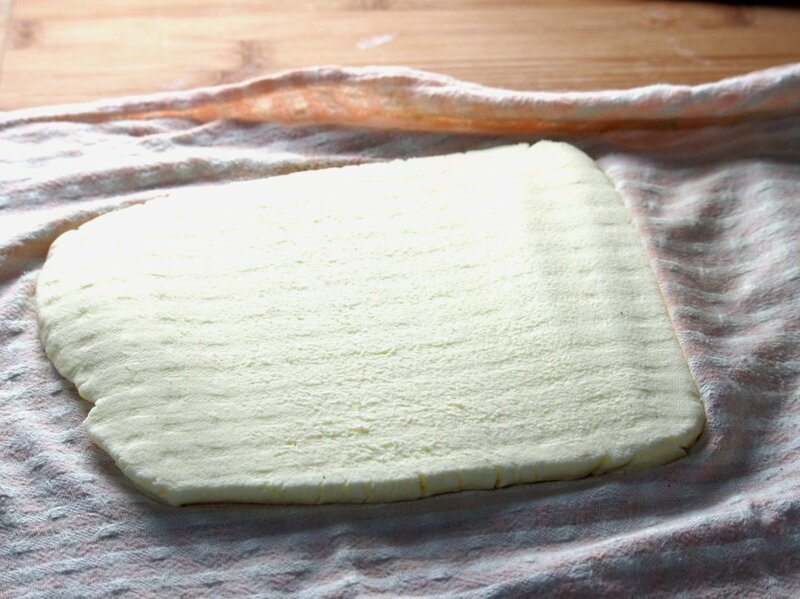 Lay another kitchen towel over the butter and pound and roll it to form an 8 x 5 inch rectangle. Wrap butter completely inside the towels and keep in the fridge until needed. After chilling the dough, unwrap it and roll it into a 16 x 10 inch rectangle. Lay the butter block on the center of the dough. The long side of the butter should be parallel to the short side of the dough. Fold the dough business letter style: Fold the bottom part over to the center to fully cover the butter. Stretch the dough as necessary to keep the edges straight. Fold the upper part of dough over to the center, fully covering the first flap. We now have the butter inside the dough. Now we begin the rolling and folding. So after the business letter fold, turn the dough so that the short side is facing you. 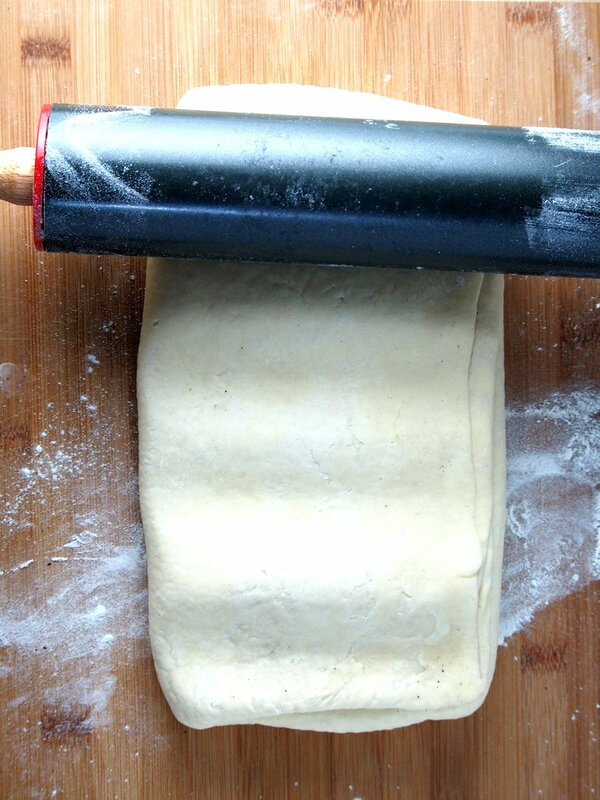 Use a rolling pin to make impressions on the surface of the dough. 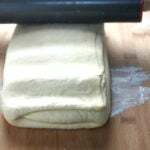 Do this by pressing the body of the pin against the dough making indented marks across the surface(see photo below). Flour your rolling pin and your working area as necessary. 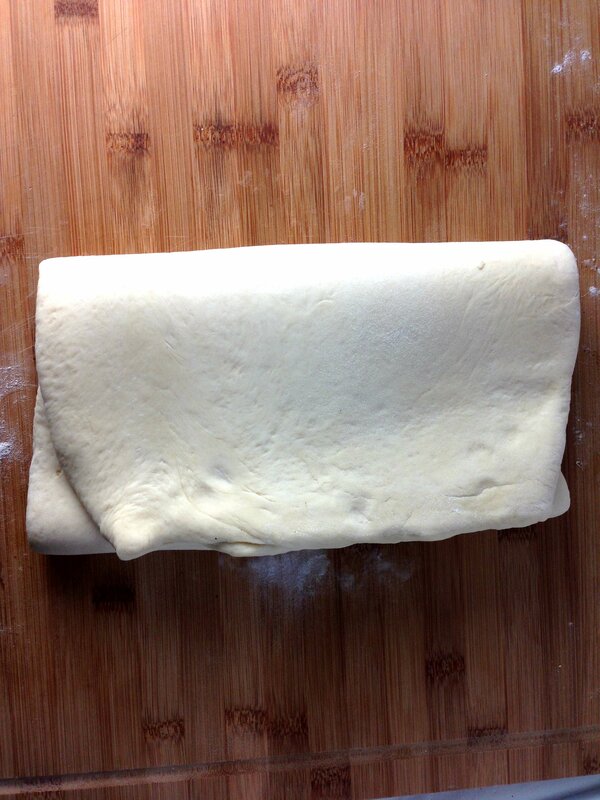 Roll the dough to form a 15 x 10-inch rectangle. Remember to roll to the ends but not over the very edges. 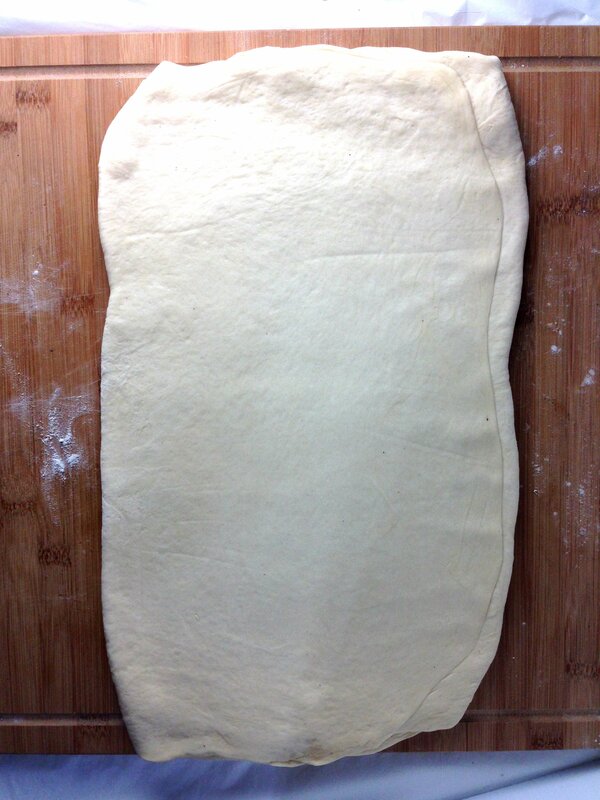 Again, lift the dough and stretch the corners to keep the rectangle straight. Now you have a 15 x 10-inch rectangle. The butter has been flattened inside the dough now. Present but not seen, except for some visible patches peeking through the dough at some point. The enclosed butter, flattened out and folded within several times will cause the beautiful layers of croissant to emerge upon baking. and the upper third down. And this is now your first fold (or first turn). Wrap this in plastic and refrigerate for 1 hour or freeze for 30 minutes. We need to repeat this rolling and folding three more times. Again, after chilling the dough, position it so that the short side is facing you. Repeat the process, rolling the dough to a 15 x 10 inch rectangle then folding it business letter style. 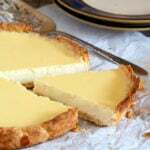 *If the butter peeks out of the dough or tearing occurs at some point, simple patch the tear with a small amount of flour to cover it. After the fourth and final fold, refrigerate the dough for at least 8 hours, but not more than 18 hours. The dough can now be used as directed in your recipe. Homemade and fresh pastries are very rewarding, so I hope that one of these days, you clear up some of your time and make this amazing croissant dough and be greatly rewarded with the divine results! A simple recipe for croissant dough that yield flaky and buttery pastry. In the bowl of your stand mixer, stir together warm milk, brown sugar, and yeast. Let mixture stand for about 5 minutes until foamy and thick . If it doesn’t foam, discard and start over. Add 3 3/4 cups flour and salt and using the dough hook attachment, mix on low for about 7 minutes, until dough is soft and smooth. Transfer dough to a work surface and briefly knead by hand for about 2 minutes. Add flour, a little at a time as needed to make a soft, slightly sticky dough. Once your dough is smooth and not too sticky, you have needed enough. You only need to use about 1-3 tablespoon of flour. You can use the rest during rolling and folding. Pat and shape dough into a roughly 1 1/2-inch-thick rectangle, wrap in plastic and chill in the fridge for 1 hour. Lay a clean, lint free towel on a clean surface (Use a towel that is not fibrous. Do not use terry towels). Arrange the sticks of butter to form a block with their sides touching. Pound butter with a rolling pin to soften slightly until malleable but still cold. Lay a second towel over the butter. Roll and pound butter over the towel until you form an an 8 x 5 inch rectangle. Wrap the butter completely inside the towels and chill in the fridge until needed. After the dough has chilled, unwrap it and transfer onto a clean, floured surface. 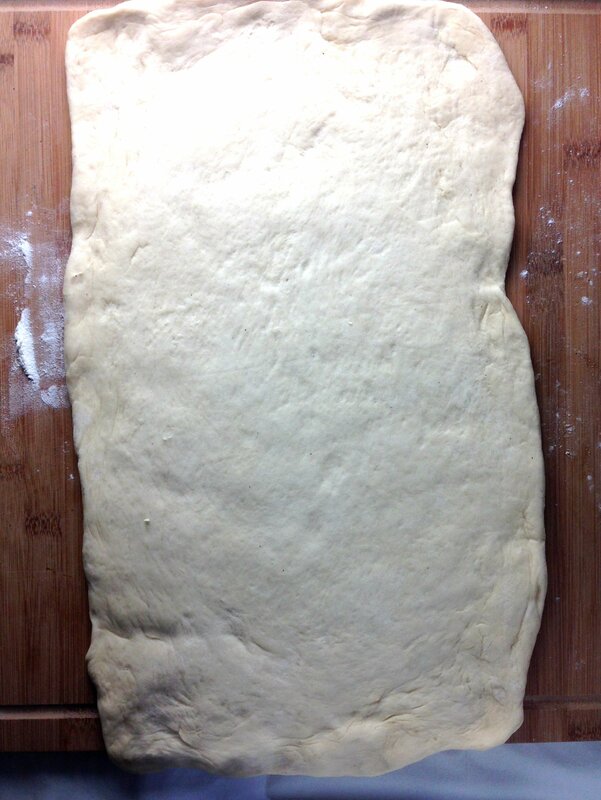 Roll the dough into a 16 x 10 inches rectangle. Flour your surface and rolling pin as needed. 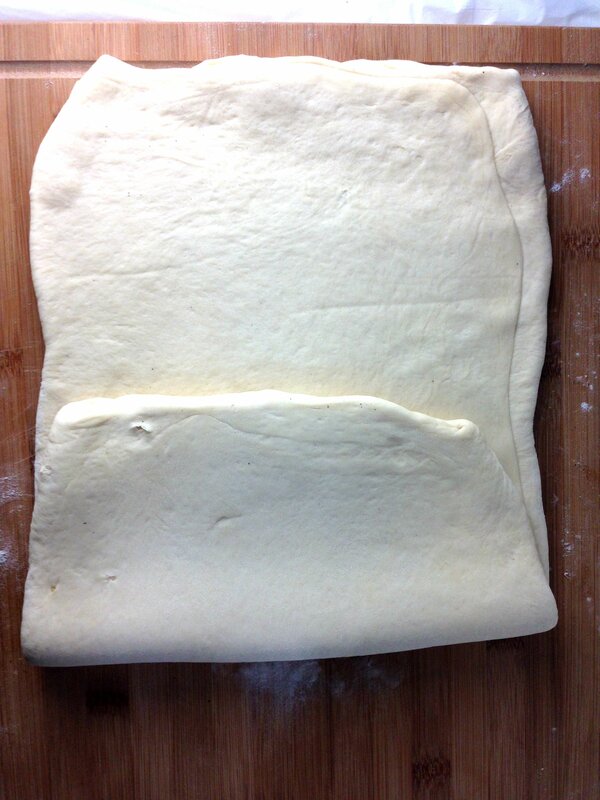 Lift the dough often and stretch the corners to maintain the rectangular shape. Unwrap the butter by gently peeling off the towels and place on the center of the dough. The long side of the butter should be parallel to the short side of the dough. Fold the bottom part of the dough over the butter, then fold the upper part of the dough over it, fully enclosing the butter inside the dough. This is called the business letter style fold. Turn dough so a short side is facing you. 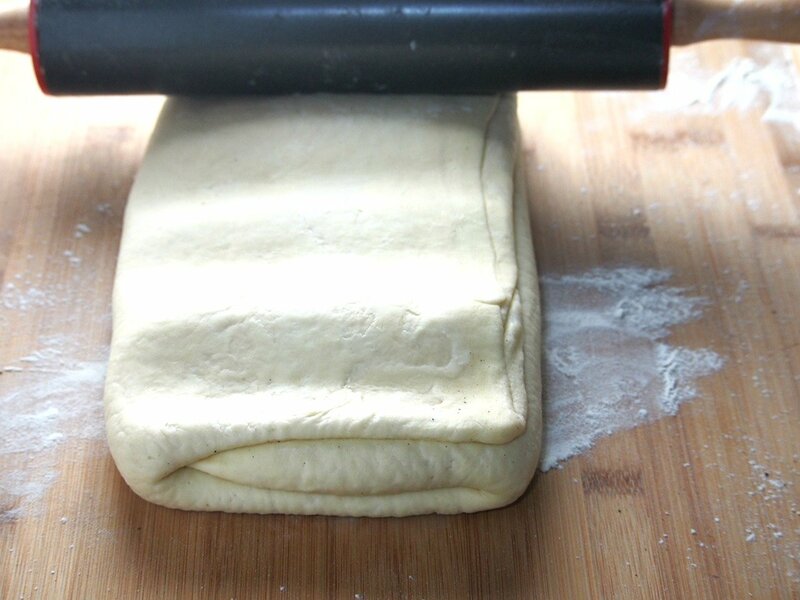 Make impressions on the surface of the dough by pressing the body of the rolling pin against the dough. Repeat until dough is flattened. Roll the dough into a 15 x 10 inch rectangle. When you roll, make sure to roll to the ends but not over the very edges, so as not to seal the layers in there. Brush off any excess flour. Fold dough, business letter style: bottom third over the butter and upper third over it, stretching the corners to maintain the sharp edges. This is your first fold. Wrap dough in plastic and chill in the fridge for 1 hour, or freeze for 30 minutes. Repeat the rolling and folding three more times: After chilling, unwrap dough and roll in the same manner with the short side facing you. Fold in business letter style and chill. After the final fold, refrigerate the dough for at least 8 hours but not more than 18 hours. The dough can now be rolled and used as directed in your recipe. Preparation times includes rise time for the assembled dough. I have never tried to make homemade croissants. I eat them all the time. I will have to give this a try on a rainy day and see what happens. Looks great!! My kids love croissants! This looks like the perfect family baking project for us before they go back to school. We love croissant but never tried making it at home. Thanks for sharing detailed recipe. Looks perfect. I will bake this for my family soon. 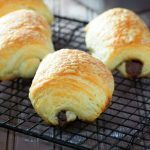 I can’t believe i have never tried making homemade croissants! It actually looks easy! I’ve always wanted to make croissants from scratch… I feel like it’s time for me to stop thinking about it and do it! I have always wanted to make homemade croissants! This is a great recipe to use for me to finally get to do that! Legitimate, delicious, flaky croissants are basically impossible to find in the US – I’ve never been able to tolerate more than a bite or two without throwing them away in disappointment. I can’t wait to try to this recipe to replicate a real croissant!